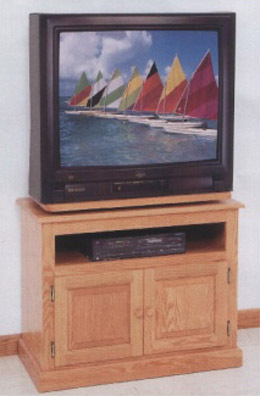 Model #617 - Is the wider version of our Amish made solid oak TV stand with swivel top, and is built to handle the bigger TV’s. Again, it features a separate space for the VCR, DVD player or Satellite receiver to give it room to breathe, and a nice, large enclosed cabinet on the bottom that features a pair of attractive raised panel doors. The bottom cabinet does not include a shelf.